If you visit the education category on the iTunes and Android app stores, you may notice that several of the apps consist of basic spelling, counting, and coloring. Given that these apps are geared towards young children and even babies, it is no surprise that children from the ages of 2 to 4 are educational media’s biggest users. However, the large use of educational media drops once children enter school. While children between the ages of 2-4 spend an average of one hour per day watching television or using online programs, this number drops to fifty minutes per day for 5-to-7-year-olds, and to 42 minutes per day for 8-to-10-year-olds. Furthermore, while 13% of 2-to-4-year-olds use devices for educational activities, only 6% of 8-to-10-year-olds do. The study explains that when children enter school they are able to access more smartphones, game consoles and e-readers, and are therefore more easily distracted by video games and other online entertainment that do not contain educational material. Are you surprised by this information? Let us know your thoughts by commenting on this post! To read the article “2-to-4-year-olds are most frequent users of educational media, study finds” by Cecilia Kang (The Washington Post), click here. To learn more about the Joan Ganz Cooney Center, click here. This entry was posted in Digital Learning, educational games on February 6, 2014 by project_tomorrow. How much do schools spend on digital learning? The Los Angeles Unified School District has sent out a survey in order to see the amount other school districts spend on technology within the classroom. The survey comes just as the Board of Education votes on the next step in a $1 billion dollar program to provide technology to students. Out of the 61 districts surveyed (21 of the largest districts in the nation on top of 40 just within California), Los Angeles Unified itself ended up as the district that has spent the most on iPads, computers, and other devices. As the nation’s second largest district, Los Angeles Unified is paying $768 per device; this high price tag is due to the district’s preference for Apple products, which tend to be pricier than PC product. Because of their high quality products, Los Angeles Unified insists that they actually received a great deal on their technology. In comparison, the Perris Union High School District in Riverside, CA only pays $344 per device, but their products do not have all the capabilities as Los Angeles Unified’s products, such as touch screens. Despite their differences in spending, both districts plan to develop curriculum that is technology inclusive: Perris Union High School District plans to use materials developed by their own staff, while Los Angeles Unified plans to create an online curriculum that is in accordance with Common Core Standards. To read the full article for “L.A. Unified surveys prices others pay for iPads, similar devices” click here. Have any comments regarding spending on digital learning? How much would you spend on a device for classroom use? Let us know in the comments section! This entry was posted in Digital Learning on January 21, 2014 by project_tomorrow. Despite the increase in use of mobile devices as classroom tools, some educators are still skeptical that these devices will distract students rather than enhance the learning environment. We teamed up with Kajeet for Education, the only wireless service provider dedicated to kids and education, to provide Chicago 5th grade and Fairfax County 8th grade students with educationally-managed broadband Android tablets using the Kajeet Sentinel Platform® to connect kids in school and at home. The Making Learning Mobile study evaluates how students use the devices (in school and out of school) to support their schoolwork and extend learning beyond the classroom, and also evaluates how teachers use the tablets to enhance the learning environment. 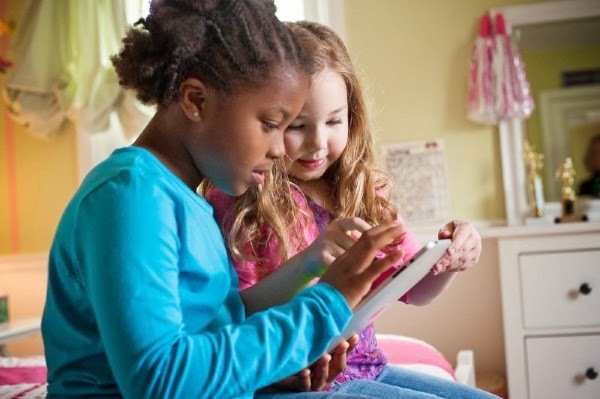 The study found that students used the tablets for more educational activities than expected. 93% of students used the tablet for Internet research, while 39% used it for completing video projects. Other uses of the device include project work, educational games, checking grades, and communicating with teachers and classmates. Furthermore, acces to Internet at home improved greatly when students were able to take their devices home to perform after school research. Students took advantage of this improvement in Internet access, as the Kajeet software on the devices noted that “three-quarters of the device requests for access to learning or academic websies occurred [after school]”; the software also found that students used the Internet and their devices to research topics discussed in class once they got home. While each school in the study yielded different results due to classroom size, age, and etc., the study found a few common results. 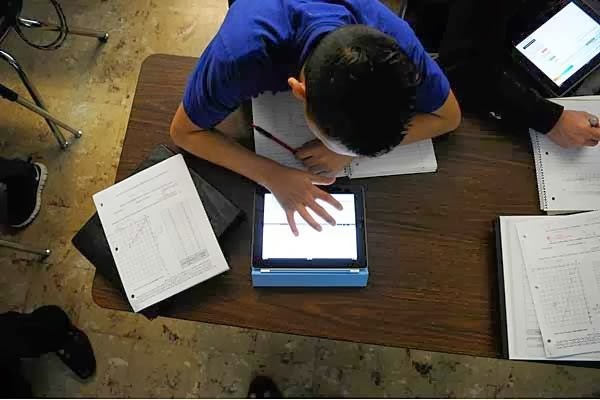 Students enjoyed using tablets because they provided easier Internet access at school, enabled students to review class materials and textbooks whenever they wanted to. Teachers enjoyed the tablets due to their flexible use in engaging students in learning and ability to increase student-teacher communications. Want to learn more about the Making Learning Mobile study? Check out “Tablets for Fifth Graders? Teachers Try Different Tactics” by Katrina Schwartz on MindShift. You can also register for the webinar at http://tinyurl.com/webinarMLM and download the complete report from both school districts on the Kajeet website at: http://www.kajeet.com/4u/education/MLM-form.html. This entry was posted in Digital Learning, Kajeet, Making Learning Mobile, MindShift, webinar on January 7, 2014 by Project Tomorrow.